Au Riverain is a lovely, extremely comfortable house offering luxury accommodation for 6 guests. The house, gardens and private heated pool have panoramic views over the Lot river and valleys below and Au Riverain is only a short walk from the pretty village of Vieillevie. It has been built in the traditional style of local houses and so offers French charm and every modern convenience. The village of Vieillevie has a highly recommended restaurant, charming chateau and local store selling basic supplies, fresh bread and croissants daily and is a short walk down from the house. It is also a post office and internet café. The nearest towns are Entraygues-sur-Truyère (17km) and Montsalvy (14km) where you will find banks, local shops, bakers, bars and restaurants plus weekly markets. The large towns of Aurillac and Rodez are about an hours drive and both offer extensive shopping, culture, restaurants and activities to suit all tastes. Izaguette is a nineteenth century, renovated, stone-built house which has retained its original charm, oak beams and exposed stone. It can sleep up to 8 people in 4 bedrooms and has a spacious kitchen dining room which opens onto a courtyard with shaded eating area. 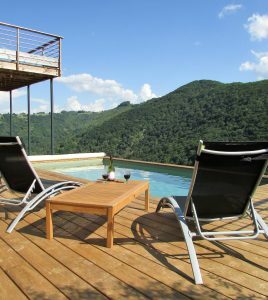 A private heated pool in an elevated position to the side of the house offers a sunny terrace for relaxing and admiring the views of the Truyère valley. A short walk through the hamlet brings you to the lakeside – ideal for an evening stroll, a picnic and a swim or a spot of fishing. Izaguette is 10kms from the medieval town of Entraygues sur Truyère which has a good range of shops and restaurants, a bank, post office, doctor, dentist and a vet. A 30 minute drive brings you to the Aubrac plateau, a stunning area with a fascinating history – the town of Laguiole famous for knife manufacture, traditional architecture and wild landscapes with an abundance of flora and fauna – a walkers paradise! 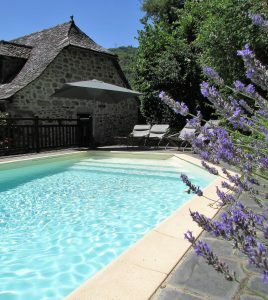 La Chapelle is an extremely picturesque cottage with comfortable accommodation for up to 4 guests. It is built into the side of a hill at one end of the secluded hamlet of Crestes, just behind the tiny Chapel that lends the house its name. The cottage is over 200 years old, built of stone with the traditional lauze roof tiles of the region. It has been renovated sympathetically whilst retaining many original features. There is a private pool and terrace overlooking the Lot Valley and miles of walks in the beautiful surrounding countryside. The hilltop village of Le Fel has two very good and interesting restaurants and tennis courts about 10 minutes drive away. The nearest towns are Entraygues-sur-Truyère (16km) and Montsalvy (10km). In both of these small towns there are banks, shops, bakers, bars and restaurants plus weekly markets, where good, reasonably priced local produce can be found. The large towns of Aurillac and Rodez are about an hour’s drive and both offer extensive shopping, culture, restaurants and activities to suit all tastes. Please note that for security purposes we cannot show the exact location of the property. Le Four is a traditional detached stone cottage nestling peacefully overlooking the River Lot in a particularly interesting section of this stunning valley. This gorgeous cottage accommodates 4 people is very charming and comfortable, has a private pool and access to the river where visitors can relax and bathe in the river. Conques, one of the most magical villages in France, is just 12 miles away. This house has the X factor and is always the most popular of our properties all year round. We recommend early booking to secure your preferred time. Le Four is in a small quiet hamlet by the river Lot near the small village of Vieillevie which is within 20 minutes walking distance. Vieillevie has a riverside restaurant, charming chateau and local store that sells basic supplies, fresh bread and croissants daily and serves as an Internet cafe. The nearest towns are Entraygues-sur-Truyère (18km) and Montsalvy (15km) and have the usual range of shops and services required plus weekly markets. The large towns of Aurillac and Rodez are about an hours drive and both offer extensive shopping, culture, restaurants and activities to suit all tastes. 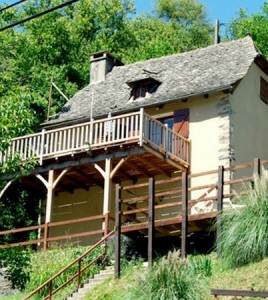 Soulou is a 200 year old cottage overlooking the River Lot in a particularly attractive and unspoiled section of this spectacular valley not far down river from Entraygues-sur-Truyère and close to the village of Vieillevie. Built in classic regional style with lauze roof tiles, the cottage has wooden balconies to make full use of the sunny position and a private pool. It has been recently renovated and has a lovely balance of refreshed tradition, lovely original features and modern comfort (including air conditioning in the bedrooms) offering utterly charming accommodation for up to 4 guests. In addition to the private pool, there is private access to the river where visitors can bathe, relax or fish. High up above the river Lot, with a commanding view over the valley, two converted 19th century barns sit side by side and form La Cabriéra. On the outskirts of the picturesque village of Le Fel, La Cabriéra offers secluded accommodation with heated pool and hot tub for four people in two bedrooms, a large living dining room and a well- equipped corner kitchen. The views from the balcony are simply stunning and there is plenty of room for outdoor eating or just lounging in the sun. The large semi in-ground spa on the terrace is perfect for relaxing on balmy evenings under a canopy of stars. A more peaceful haven is hard to find. There is a new 6m x 3m heated swimming pool to the right of the hot tub spa with wooden decking and breath-taking view of the river Lot far below. The village of le Fel is within walking distance (1km) and offers two restaurants, wine tasting, a tennis court and a marked out circuit through the vineyards offering remarkable views at every turn. The pretty village of Vieillevie is 8 miles down river and has a highly recommended hotel restaurant, charming chateau and local store selling basic supplies, fresh bread and croissants daily. It is also a post office and internet café. The nearest towns are Entraygues-sur-Truyère (8 miles up river) and Montsalvy ( 6 miles) where you will find banks, local shops, bakers, bars and restaurants plus weekly markets. The large towns of Aurillac and Rodez are about an hour’s drive and both offer extensive shopping, culture, restaurants and activities to suit all tastes. Belle Vue is a traditional large stone cottage for 4 people with a wonderful new pool and stunning panoramic views. The property overlooks the confluence of the rivers Lot and Truyère that meet in the beautiful medieval town of Entraygues-Sur-Truyère. Originally a small vineyard, the house is positioned to enjoy the warmth of the sun on a south-facing slope of the Lot Valley. The garden extends to approximately an acre and includes a small oak copse and a stone bread oven, new private swimming pool and terrace. A delightful but steep walk takes you down to the medieval town of Entraygues that has a full range of shops, local butchers and bakers, numerous cafes and restaurants. Farmers markets on Fridays and in the summer, night markets, provide local speciality food and entertainment in the market square. Leisure amenities include canoeing, horse riding, river rafting, tennis, golf and river walks. Conques and Estaing, two of the “Beaux Villages de France”, are just a short distance away. The large towns of Aurillac and Rodez are about an hour’s drive and both offer extensive shopping, culture, restaurants and activities to suit all tastes. La Ramonette is a charmingly renovated 250 year old stone cottage with traditional lauze roof tiles, particular to the area. Perched on the slopes of the ancient Le Fel vineyards in spectacular fashion, with panoramic views over the River Lot and surrounding valley, the house can comfortably accommodate up to 6 people and has a private pool. It is 5 miles from the lovely village of Entraygues-sur-Truyère and 6 miles from the hilltop village of Montsalvy. The picturesque village of Le Fel with its two restaurants is a short drive or a 30 minutes walk through the steep vineyard terraces. Montsalvy and Entraygues are both 9 kilometers away. In both of these small towns there are banks, shops, bakers, bars and restaurants plus weekly markets. The large towns of Aurillac and Rodez are about an hour’s drive and both offer extensive shopping, culture, restaurants and activities to suit all tastes. 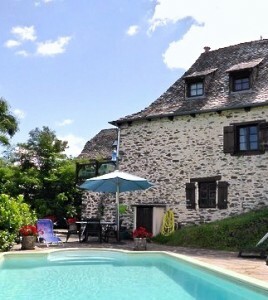 The cottage is only 7km from the medieval town of Entraygues that has a full range of shops including local butchers and bakers, numerous cafes and restaurants. Farmers markets on Fridays and in the summer, night markets, provide local speciality food and entertainment in the market square. Leisure amenities include canoeing, horse riding, river rafting, tennis, golf and river walks. Conques and Estaing, two of the “Beaux Villages de France”, are just 12 miles away. The large towns of Aurillac and Rodez are about an hour’s drive and both offer extensive shopping, culture, restaurants and activities to suit all tastes. 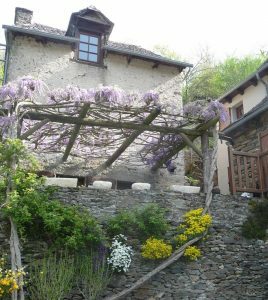 Canonge is a lovely cottage for 5 people set amongst the terraced vineyards of Le Fel and looking down onto the Lot valley and river 860ft below. This is the oldest house in le Fel, built of stone with lauze tile roof and over many years has been creatively renovated by the French owners. They have filled the house with wonderful curiosities that give the house its own special ambience. The cellar goes back to the time when monks produced and stored their wine here as does the current owner. Guests are welcome to browse and select a bottle from the cellar leaving payment in the honesty box. The house and pool are set in magnificent surroundings enjoying views that will take your breath away. This has got to be one of the most amazing holiday properties in the region both for its views and the layout both in the house and outside. There are many different levels and steps between terraces and rooms – all delightful and charming. Canonge is a house extraordinaire! However, we would not recommend the house for families with children under the age of 14. The picturesque village of Le Fel with its two good restaurants is a short drive away,or a 20 minutes walk through the steep vineyard terraces. Montsalvy and Entraygues are both 9 kilometers away. In both villages there are banks, shops, bakers, bars and restaurants plus weekly markets, where good, reasonably priced local produce can be found. The large towns of Aurillac and Rodez are about an hour’s drive and both offer extensive shopping, culture, restaurants and activities to suit all tastes. Please note that for security purposes we cannot show the exact location of the property. La Soue is one of four beautifully converted former outbuildings of the 18th century farmstead “La Domaine du Puech” overlooking the valley of the Auze River, which flows into the Lot in the nearby village of St Projet. This sympathetically renovated former “piggery” brings together the traditional features of the 18th century and the style of the 21st; the local schist stone and the ancient chestnut timbers provide a dramatic backdrop to the comfortable modern fittings. 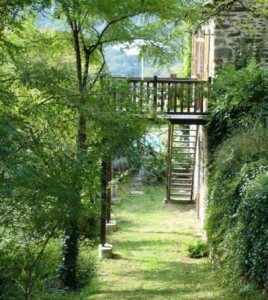 La Soue can sleep 4 people and has a private garden and use of the communal grounds and swimming pool. The former farmstead known as “la Domaine du Puech Fleury” is in a magnificent setting with an abundance of historical and natural interest. Its wonderfully landscaped grounds, rich with ancient trees, interesting shrubs, palms and Mediterranean mimosas look out over stunning views of the Auze river valley below. At the turn of the 19th century, the hamlet and several of those surrounding it, was home to a religious sect known as ‘the floured ones’. A fascinating history surrounds them, elements of which are still visible today. This remarkable site is home to 4 lovely gîtes, formerly outbuildings of the original 18th century farm. Each property has been converted to retain their individual original features whilst offering modern comfort, convenience and privacy, with its own access and private secluded garden with shared use of the 8 x 4 metre saltwater pool overlooking the valley. 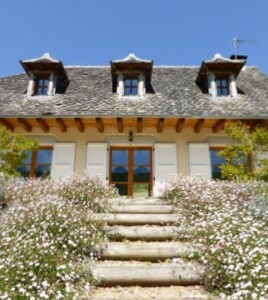 Taken as a whole the Gîtes can sleep 15 people, which makes it an ideal holiday location for an extended family, a group of friends or a club. Contact us for special rates and availability. This little known area has many hidden gems and much to offer walkers, nature lovers, sports enthusiasts, culture seekers, gastronomes, historians or those who simply want to relax and enjoy the peace of rural French life, clean air and beautiful surroundings. Cassaniouze, the nearest village only 5kms away, has a general store, boulangerie, café/restaurant and bank and nearby there is a large lake for swimming, fishing or hiring a pedalo. A further 5kms takes you to Calvinet where you will find all the necessary services, pharmacy, bank, butchers and bakers. There is also the Hotel Beauséjour, one of only two Michelin starred restaurants in the Cantal and very good value. Calvinet is renowned locally for it’s Christmas market and illuminations, so why not take a winter break in this beautiful unspoiled part of France. The “domaine” is a short drive from Conques, which dates back to the 9th century and is magnificently preserved. Classified among the most beautiful villages in France and a UNESCO “World Heritage Site”, Conques is also a major staging post on the spiritual path to Saint-Jacques de Compostella. Beyond Conques is Marcillac, a delightful town with banks, supermarkets and post office. Every Sunday morning it stages a wonderfully colourful market. The large towns of Aurillac and Rodez are about an hour’s drive and both offer extensive shopping, culture, restaurants and activities to suit all tastes. 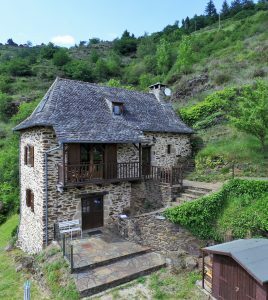 A former working farmhouse with several small charming outhouses, this beautiful renovated stone cottage for up to 5 guests sits amongst mature trees on a hilltop overlooking the valleys and hills of this lovely area close to the historic village of Conques. The house has a private swimming pool and sunny terraces surrounded by sweeping lawns. It is a perfect house for a family holiday or for those seeking seclusion and comfort in a peaceful setting with fabulous views. 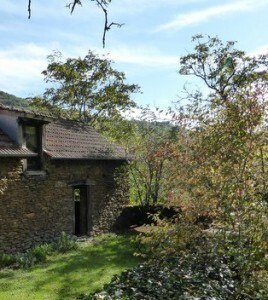 The cottage is located just 10 minutes from Conques, which dates back to the 9th century and is magnificently preserved. Classified among the most beautiful villages in France and a UNESCO “World Heritage Site”, Conques is also a major staging post on the spiritual path to Saint-Jacques de Compostella. Grand Vabre is just five minutes drive away. There is a small supermarket, two restaurants and a bar plus a garage with fuel. Beyond Conques is Marcillac, a delightful town with banks, supermarkets and post office. Every Sunday morning it stages a wonderfully colourful market. The large towns of Aurillac and Rodez are about an hour’s drive and both offer extensive shopping, culture, restaurants and activities to suit all tastes. 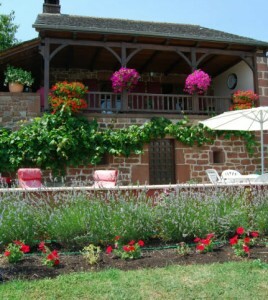 La Grange is a pretty stone cottage with traditional lauze tile roof for up to 4 guests. Located in the charming riverside hamlet of La Regaldie on the River Lot, the cottage has recently been lovingly renovated by local craftsmen to provide airy open plan living on 2 levels, furnished to a high standard. The private pool is set in the grounds behind the property. Grande Vabre, situated at the confluence of the river Dourdou and the river Lot, is the nearest village – 2km away. It has 2 good restaurants (well attended by locals), a boulangerie and a small local store. 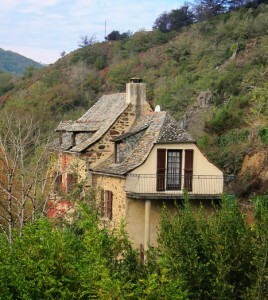 The cottage is located just 15 minutes from Conques, which dates back to the 9th century and is magnificently preserved. Classified among the most beautiful villages in France and a UNESCO “World Heritage Site”, Conques is also a major staging post on the spiritual path to Saint-Jacques de Compostella. Beyond Conques is Marcillac, a delightful town with banks, supermarkets and post office. Every Sunday morning it stages a wonderfully colourful market selling excellent local produce. In the opposite direction 6km along the river is the village of Vieillevie which has a delightful restaurant with a beautiful wisteria-covered riverside terrace, internet café, and local village store which sells fresh bread and croissants daily. The picturesque hilltop hamlet of Le Fel is 10 minutes away with restaurants, vineyards, and tennis courts. The village of Entraygues-sur-Truyère where the Lot and the Truyère converge is only 20 minutes away and offers full services including shopping, cafés, restaurants, post office, bank, etc. The large towns of Aurillac and Rodez are about an hour’s drive and both offer extensive shopping, culture, restaurants and activities to suit all tastes. 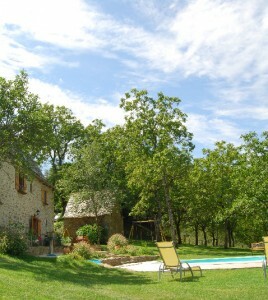 Les Glycines is a traditional stone cottage, for up to 4 people in the hamlet of Soulou overlooking the River Lot near the historic village of Vieillevie. Soulou consists of just three riverside cottages: Les Glycines being one and the others are Le Four and Soulou cottage, both of which are also under our management. Built of local stone in traditional regional style, this pretty cottage has a lauze tile roof, south facing balconies with wonderful river views and access to river frontage ideal for peaceful picnics in total seclusion for just swimming and relaxing. 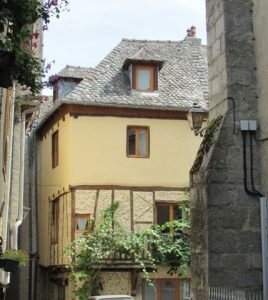 Les Couteliers is a lovely town house on four floors, in the heart of the medieval village of Entraygues sur Truyère. The house has been beautifully restored with attention paid to the original features such as exposed oak beams which are complimented by the tasteful and comfortable furnishings. There are 2 bedrooms with ensuite bathrooms. For enjoying the location and balmy weather there is a balcony and small patio. Located in the heart of lovely Entraygues-sur-Truyère in a quiet street the house is perfect for exploring the town which has all your needs: banks, local shops, bakers, bars and restaurants plus weekly markets. The large towns of Aurillac and Rodez are about an hour’s drive and both offer extensive shopping, culture, restaurants and activities to suit all tastes. La Maison du Gallois is a charming private apartment on the ground floor of the owner’s house, ideal for two adults with an additional two guests on the sofa bed and day bed if required. 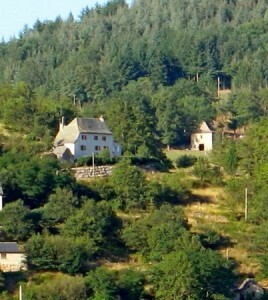 It is situated on the top of a hill with sweeping views 100km across the valleys to the mountains of the Aubrac. It is a haven of tranquility for those who just wish to relax, but ideally placed for those who wish to see more of this glorious part of France. There is a wonderful pool with decking and sunbathing areas. The accommodation is on one level, with parking very close to the door, so although not specifically adapted for the handicapped, it would be suitable for people with reduced mobility. 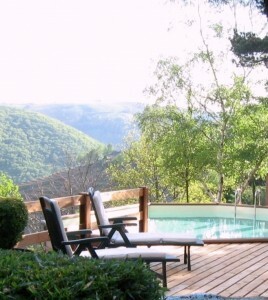 Situated on a hill between Nauviale and Plateau d’Hymes. Nauviale is 3km away and has a bar/restaurant and post office. St Cyprien (6km) has shops for most of your daily needs, including an excellent bakers and two good restaurants. The regional capital of Rodez is 30km and the smaller towns of Marcillac or Decazeville are a short drive away. There are market days at several of the local towns where glorious local food and wine may be bought inexpensively. Enfialère is a 200 year old renovated stone cottage, for up to 6 people, facing south with glorious views overlooking the River Lot. The picturesque village of Le Fel is about 1 mile up the hill with 2 good restaurants and tennis courts. Entraygues is 5 miles along the river. 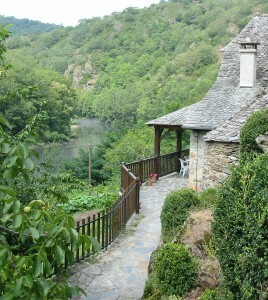 Every room in the cottage has wonderful views both of the river and the glorious woodlands on the valley slopes. 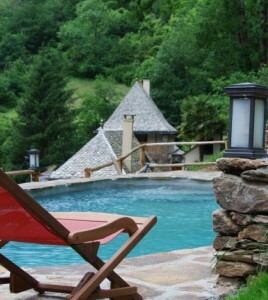 The private swimming pool is in a sheltered, sunny position with good seclusion for sun bathing. Although not adapted for handicapped people, the house would be suitable for people with reduced mobility. The picturesque village of Le Fel with its two good restaurants is a short drive away, or a 20 minute walk through the steep vineyard terraces. Montsalvy and Entraygues are both 9 kilometers away. In both villages there are banks, shops, bakers, bars and restaurants plus weekly markets, where good, reasonably priced local produce can be found. The large towns of Aurillac and Rodez are about an hour’s drive and both offer extensive shopping, culture, restaurants and activities to suit all tastes.